In the last post on Adaptive Shrinkage, the Average Correlation Shrinkage (ACS) model was introduced and compared with other standard shrinkage models. 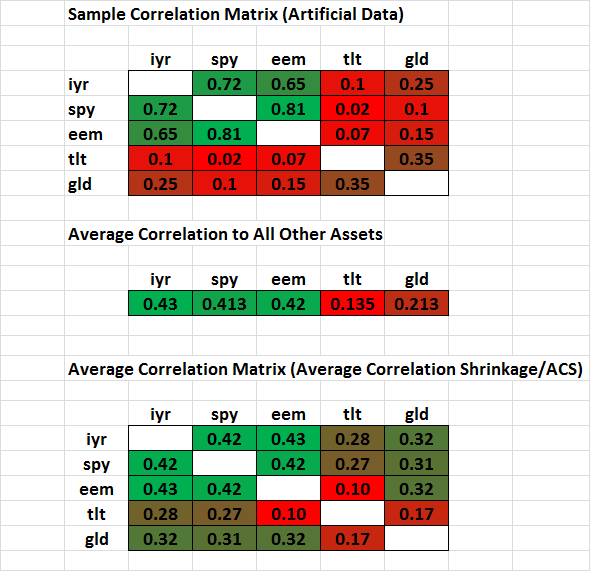 A spreadsheet demonstrating how to implement ACS can be found here: average correlation shrinkage. This method is meant to be an alternative shrinkage model that can be blended or used in place of standard models. One of the most popular models is the “Constant Correlation Model” which assumes that there is a constant correlation between assets. The strength of this model is that it is a very simple and well-structured estimator. The weakness is that it is too rigid and its performance is dependent on the number of similarly correlated versus uncorrelated assets in the universe. Average Correlation Shrinkage proposes that a good estimator for an asset’s pairwise correlation is the average of all of its pairwise correlations to other assets. For any pair of assets, their new pairwise correlation is the average of their respective average correlations to all other assets. This makes intuitive sense, and the average is less sensitive to errors than a single correlation estimate. It is also less restrictive than assuming that all correlations are the same. Hi David. 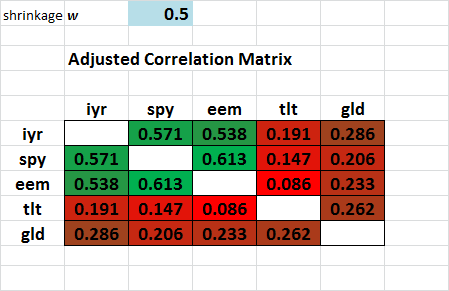 Shouldn’t the average correlation for eem and tlt be 0.28? The formula on your spreadsheet appears to be pointed to the wrong cell. I like the idea though and might try it out as a shrinkage estimator in some of my own tests.